Edinburgh is heading towards a more sustainable future. By 2040, the university’s goal is to be net zero carbon and there are efforts all around campus to push for involvement in sustainable activities. There’s a bikeshare on campus to reduce the need to take buses or taxis. 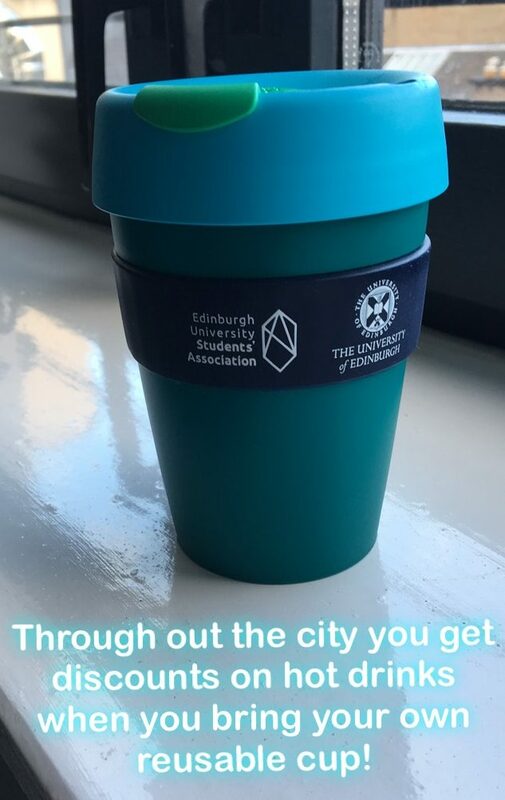 To reduce the amount of disposable coffee and tea cups used, the university and many surrounding stores sell Keep Cups for about 8 dollars. At the beginning of the school year the Department for Social Responsibility and Sustainability was giving them away for free if you signed up for their mailing list, as were the university cafes if you bought a hot beverage! Many cafes and coffee stands around the city will give you a 10p or 20p discount when you use these reusable cups. 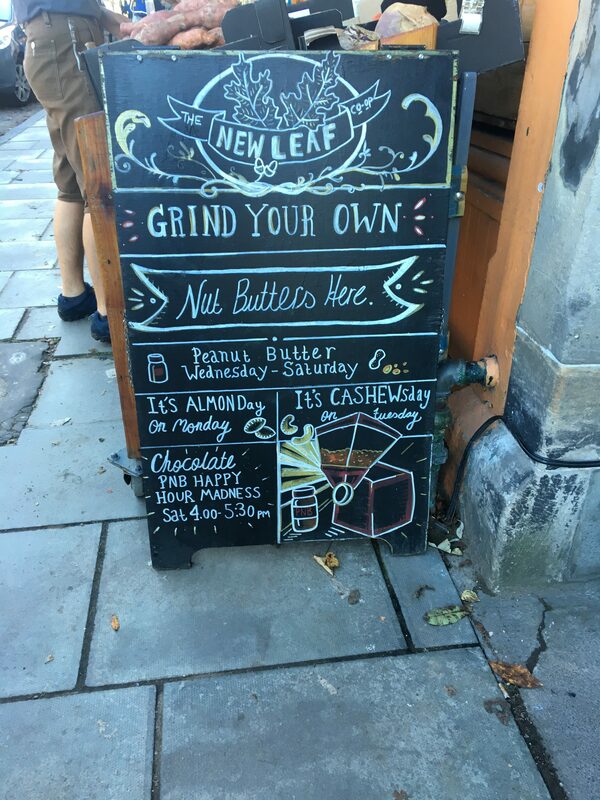 For fresh veggies and other yummy food, every Thursday there’s a vegetable/dry goods stall on campus called the Hearty Squirrel. The vegetables are all locally grown, organic, and seasonal. The dried goods include nuts, pasta, oats, an assortment of grains, chia seeds, herbs, and dried fruit. They give them to you in a brown paper bag, or you can bring your own containers and they’ll fill those for you. The veggies, eggs, and bread have to be ordered the Monday before, but the dry goods are on a first come first serve basis. You never know which veggies you’ll get or how many of each so I’ve had a fun time trying new recipes to use up my veggies. I look forward to going to the Hearty Squirrel every week and occasionally volunteer at the stand! All around the city there are charity shops. Charity shops are second hand shops that donate their proceeds to a specific foundation. Some of them around campus include Pets in Need of Vets, Save the Children, Cancer Research, and Salvation Army. You can find almost anything you could possibly need at these shops: clothes, kitchenware, books, tables, etc. I bought plates and cutlery, a rain jacket, jeans, books, greeting cards, some decorations for my room, and even a brand new duvet cover! It’s so much cheaper and more sustainable to buy from charity shops. And you know that your money is going towards a good cause! However, here more so than in the United States, many of the regular grocery stores sell nearly ALL of their produce wrapped in plastic or in a plastic bag. You know how a bunch of asparagus is usually just held together with a rubber band? Here it’s in a sealed plastic bag. You can’t just buy one apple in some stores. Instead they’re sold in packs of four wrapped in sealed plastic, too. I’m not sure if this is specific to some grocery store chains, if it has something to do with living in the city , or something else completely. It’s really frustrating because these stores are all so conveniently located, and there are other shops that use less plastic, but they’re further away. The shops sell whole foods that aren’t wrapped in plastic/have less plastic, and the prices are comparable to the chain grocery stores around. My favorite of these shops is called the New Leaf Co-op. (They started the Hearty Squirrel on campus!) Their fruits and veggies are local and organic. Too, they sell bread and baked goods, health and beauty products, and they have refill stations. For these stations, you bring your own containers and fill them up with the foods or products that you need. They even sell laundry detergent like this! Then you just pay for the weight of the product. Refill shopping is cheaper and reduces packaging waste! I usually find myself going to these further away shops with reduced packaging, though not all the time. Sometimes the convenience of a shop 3 minutes away wins, but even when I buy from these chain grocery stores, I try to be conscientious of the amount of plastic I’m buying. It’s not always easy to make green decisions, but living in Edinburgh sure makes it a easier.